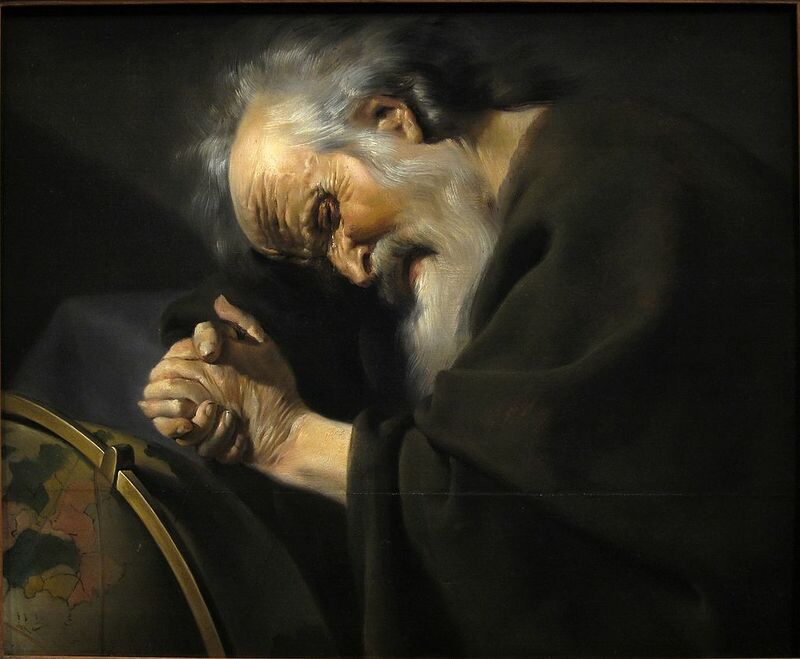 Heraclitus was a Greek philosopher who was active about 500 BC. He said that everything is made of fire. This makes him sound like the other early Greek philosophers, who looked for one material they thought must be common to all that exists. But Heraclitus’ view was more sophisticated. He believed that strife is the basic condition of the natural world and that everything is in continuous motion and change. He made the famous statement that a person cannot step into the same river twice. Heraclitus believed that the unity of things lies not in material substance, but in a delicate balance or tension of opposing forces. Fire – because it is always in motion – is a good symbol of Heraclitus’ view of the universe. Heraclitus was born in Ephesus of an aristocratic family. He was scornful of people and lived in isolation. In ancient times, he was called the Obscure because his philosophy was hard to understand. Heraclitus of Ephesus, continuing the search of the Ionians for a primary substance, claimed it to be fire. Heraclitus taught that fire is the primordial source of matter, but believed that the entire world is in a constant state of change or flux and that most objects and substances are produced by a union of opposite principles. He regarded the soul, for example, as mixture of fire and water. The concept of nous (mind), an infinite and unchanging substance that enters into and controls every living object, was developed by Anaxagoras, who also believed that matter consisted of infinitesimally small particles or atoms. He thus epitomized the philosophy of the Ionian school by suggesting both a non-physical governing principle and a materialistic basis of existence. With Heraclitus, philosophy was less confused with scientific speculation. He was principally concerned with the philosophical question of how things change and how there can be many things in the world, and also how both change and multiplicity can be reconciled with the permanence and oneness of the world. Everything is constantly changing, he said; but this change is of the very essence of reality itself, for things only exist by maintaining a king of tension between opposite elements. internal knowledge is beauty and art. it never changes.